Around 200 people gathered at the Elgin Street courthouse on Friday night to protest the treatment of survivors of sexual assault by the justice system and police. The acquittal of former CBC radio host Jian Ghomeshi has sparked protests across the country. On Thursday, after a high profile court case, Ghomeshi was found not guilty of one count of choking and four counts of sexual assault. In his decision, the judge said there were significant issues with the credibility of the three complainants. Protestors say the verdict is emblematic of a justice system that continually fails survivors of sexual assault. Photos and video taken by Alison Sandstrom. Indigenous women open the rally with a song. Rally organizers Samantha Belleus and Amina Ghadieh. 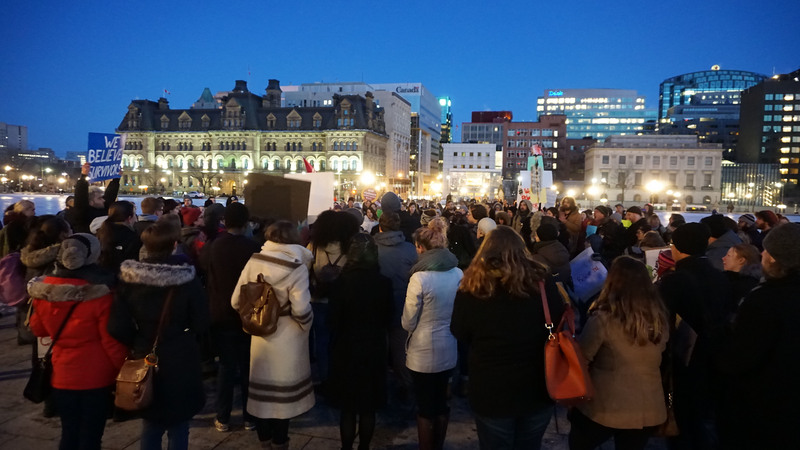 Following the rally, demonstrators marched to Parliament Hill. Gaela and Chad Nelson hold signs.